Thank you very much for fixing all those games, you are really amazing Sluffy. Thanks for the support. Decided to fix Kirby 3 butch boss in the long meantime. Maybe more like "See you later!" than "Adieu!" (for now). Someone's offered to do some dirty work of dissecting games and documenting them in case I feel like doing a few now and then. If that person is actually serious, we'll see how that works out over the mid-year. Won't be personally reading the forums much a week. 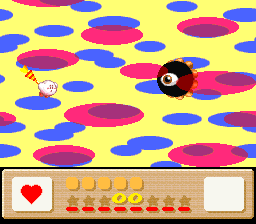 Tengai Makyou Zero is hilariously good (pre-hermit). And Tom knows how to communicate a script with energy. We'll be here whenever you decide to come back Sluffy! Seriously though, no worries at all. Will go ahead and test out the Kirby 3 patches. Is the green and yellow colored clouds due to the anti-epilepsy, so only with 10A2-10A4? I was finally able to beat Butch Boss in Snes9x, and I only saw the red and blue colored clouds. I'm not exactly sure, but I think red might be the correct color? Not sure. I haven't tried the Canoe patches yet, will do those now. Actually Arkiokin, you're right. I think the orange-ish (red-orange?) color is correct. It just dawned on me that when the picture gets displayed at 256, the red foreground and the yellow background will "blend" to create the orange-ish color. Actually Arkiokin, you're right. I think the orange-ish color is correct. Yes, green and yellow colors seem to be the most obvious prove of the anti-epilepsy protection, or at least like it is on Virtual console and only with pid A210, A310 and A410. It was the first time I combined one of these pid with a sluffy's "already transparency safe" patched rom, and the green-yellow color is the resulting. (tested also boss butch with 1d patch + A410 : green-yellow too but same yellow than it is with vanilla not like it is with 2b). However, the flashing effect after beaten first form of the boss seems to NOT be affected by this anti-epilepsy protection. So, a sluffy's patched rom + A410 is not entirely affected by all the consequences of this anti-epilepsy protection. Had the understudy (kitspin) run some tests on more color blending ideas. Changing backdrop seems only method that blends correctly on butch boss6 (magenta color in particular). I put in the color switches and assuming this works based on report. Release time. This should be 'final' snes9x version. Canoe will still have sram going crackers. Asking the helper to go through other sa-1 games to see how saves are done. Apologies for the late testing, got a bit caught up in something. kirby3-2b_canoe.bps + 109C = No change unfortunately. I got the exact same results as Arkiokin, still freezes on final boss stage 2/3 unfortunately. kirby3-2c.ips + 0000 = Success! The colors/blending appear to be the correct colors, they look identical to original hardware to my eyes! This is definitely the "release" version for Kirby 3 patches. Same results on Snes9x as well. The SRAM issue really isn't too big of a deal, so it's no worries, no hurry at all. At the very least, we know for a fact that it's Preset ID related. Or at least the Preset ID is what enables the constant save-to-SRAM. Maybe there's another Preset ID out there that also enables it? I don't know. I made also tests with kirby3-2c.ips : I can confirm pimpinelephant results on butch boss 6 : colors are perfectly correct now (orange clouds), well done sluffy ! As expected, boss 6 always freeze up with 9C10, but all is fine with pid 0000 and a SA-1 extra-byte value. Also tried same things of testing slowdowns on level 1-2 (for sounds) and level 5-6 (for graphics) with previous configuration (0B + -no-lowlatency) : works fine. - No bubbles graphic glitch but screen out of place and sound issues. I don't know if would be better to fix this one instead the US version. 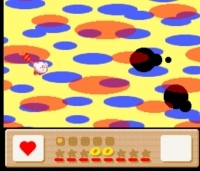 Puzzle Bobble (EU) definitely has the graphical glitch, I tested it after someone on Reddit asked about it. Your audio issues were because you didn't convert it to NTSC. Canoe doesn't like PAL ROMs. Fixing shaking would auto-fix bubble glitch. Fixing shaking isn't working and there's nearly no alternates other than mode4 pid. Fixing gradient would require converting menus to mode1-512 (Kirby 3 hires). Canoe is too stubborn about mode5 problems. With this patch the Boss dying effect displays correctly using 1016. However the textboxes are too bright (high gamma), in menus the text is black. The small glitchy line in battles is still there. Honestly, the gradient menu is kinda ugly. Not worth the trouble! TBH, don't know what happened with text box gamma or menus. It's all in there still using new method. I think I'll look at this myself since something went wrong. Which text boxes are gamma again? dialogue and battle? -- it's both. That's it. I'm taking over asm writing duties. Divvy up some of the other tasks. 3) ?? buggy battle line ?? rudra3-3a + 1016 = Extra line during battles is fixed, but other issues persist. The extra line is gone! Unfortunately, the battle menu boxes are still high gamma. Everything else is looking great though. I was not able to test the boss death effect yet, I was testing the original Japanese ROM, while the save is for the English translation. I will get to a boss and test it out though. rudra3-3a-experiment gradient = No good, unfortunately. This patch turns all of the text black. What's the difference between these two? They looked pretty identical to me. Both display the gradient in menus, but the text will get slightly darker at the top and bottom of the screen (where the gradient gets darker). What should I be looking for in terms of differences for these two patches? Either way, the extra line during battles is officially gone! Woohoo! Just a couple of issues persist now, but this game is very close to 100% fixed! Awesome job once again Sluffy! no gradient was supposed to remove gradient. Which laughably did in bsnes but not Canoe. Canoe has some transparency error so colored it black (vs heather grey). Oh, ok! That makes sense. I completely thought I did something wrong, since the checksum are different for each, but they each don't match the calculated checksum. Good to know it's supposed to be like that. Also, the darker text for the gradient menus is pretty darn slight. I actually didn't notice it immediately. It took me a couple of seconds while looking at the menu to really notice it. So it really is an extremely minor issue, not a big deal at all! Battle text box - the one that mentions the attack or spell or item name? Assuming that's the leftover problem. Add empty subscreen and be done with that part. Read below post. I see, that's rather odd side-effect. I just tested it again, and the high gamma is present on every battle menu box. Enemy list, party list, battle menu list, mantra list, item list. The only text boxes that are not high gamma are the text boxes that appear in-between turns after selecting actions (I'm assuming they're the action names), as well as the text boxes for EXP and Money gained after the battle has concluded. Those two text boxes are fine and don't display the high gamma, everything else does though it would seem.